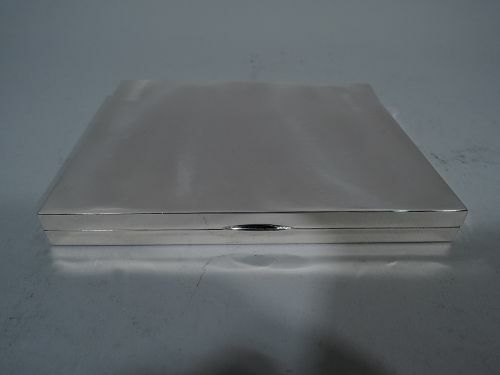 Smart and modern sterling silver cigarette box. Retailed by Tiffany & Co. in New York. Rectangular with straight sides. Cover flat and hinged with tab. Interior gilt and partitioned. An attractive desk accessory that is still useful in the post-tobacco era. Good condition with crisp corners. 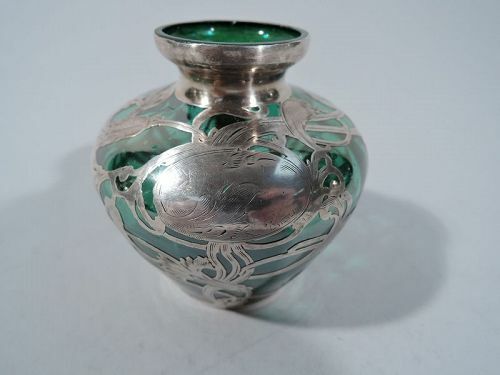 Art Nouveau emerald green glass bud vase with silver overlay. Made by La Pierre (part of International) in Newark, ca 1900. Ovoid body with short neck in silver collar. Entwined and whiplash floral overlay heightened with engraving. Scrolled cartouche (vacant). Sweet and diminutive. Hallmarked. Very good condition with nice patina. 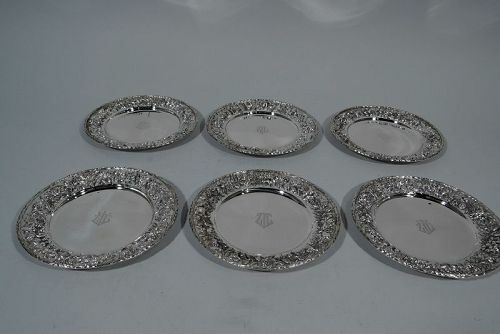 Set of 6 sterling silver bread and butter plates. Made by S. Kirk & Son Inc. in Baltimore. Plain well bordered by repousse garland on stippled ground. Engraved monogram. Early 20th-century hallmark (1925-32) with no. 28. Very good condition. 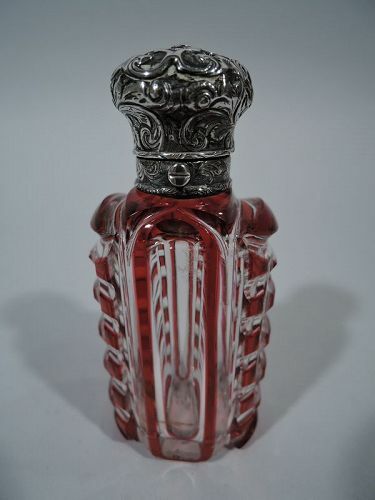 European silver and cut-to-clear red glass perfume, ca 1880. Ovoid bottle with cut geometric ornament. Silver collar and hinged bun cover with worked scrolls. Tactile and eclectic. Unmarked. Good condition. 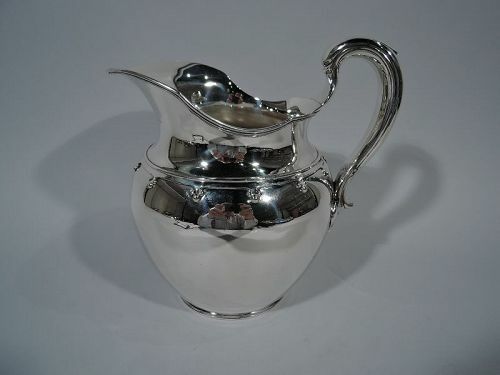 Sterling silver water pitcher in Saint Dunstan pattern. Made by Tiffany & Co. in New York, ca 1910. Globular with capped high-looping handle, helmet mouth, and reeded foot ring. Fleur de lys band applied to shoulder. 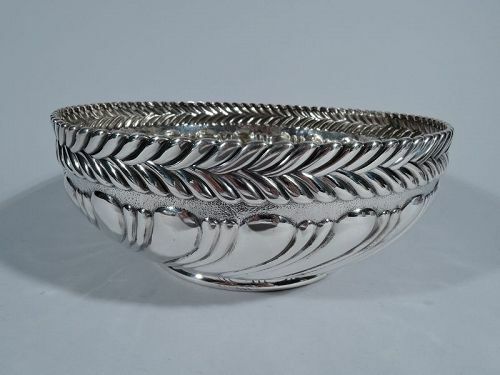 A great piece in this classic pattern. Hallmark includes pattern no. 14116D and director’s letter m (1907-47). Very good condition. 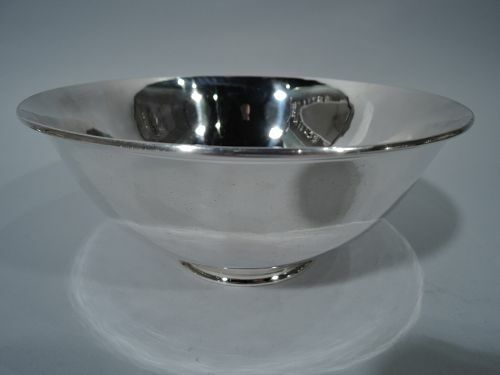 Sterling silver bowl with bold ornament. 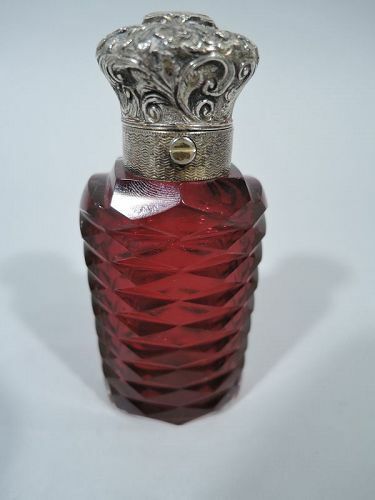 Made by Tiffany & Co. in New York, ca 1884. Round with curved sides and foot ring. Double narrow gadroons alternating with single wide gadroon. At rim chased and repousse band of stylized and imbricated chevrons (or leaves). This pattern sometimes called Wave Edge. Hallmark includes pattern no. 8060 (first produced in 1884) and director’s letter M (1873-91). Fine condition. 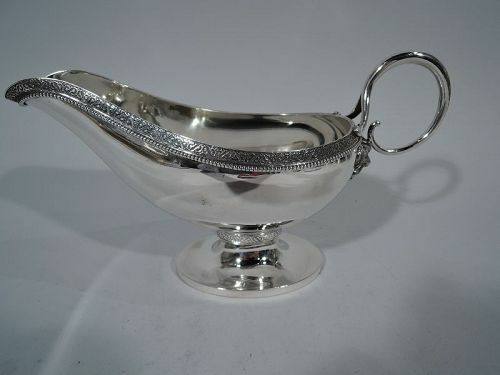 Classical sterling silver gravy boat. Made by Gorham in Providence in 1871. Curved body with helmet mouth, raised oval foot, and loop handle with mask mount. Raised rinceaux on stippled ground and beading. Hallmark includes date letter and no. 112. Fine condition. 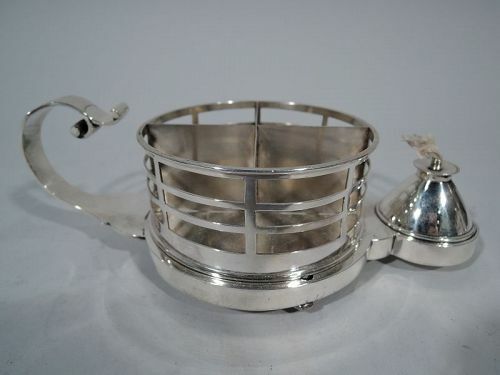 Victorian sterling silver cigarette cup and lighter. Made by Louis Dee in London in 1883. Round cup with solid well and partitions. Sides have open rectangles. Flying scroll handle and conical lighter. Rests on 3 discs. Functional and advanced design. Hallmarked. On underside Parisian retailer's name Love & Harvey. Very good condition with threaded wick. 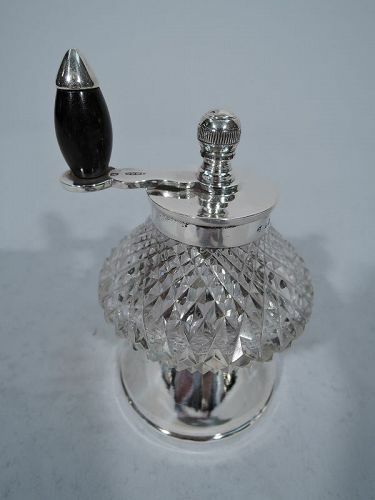 Nostalgic glass vanity jar with enameled sterling silver cover. Made in London in 1934. Oval jar with straight and fluted sides. 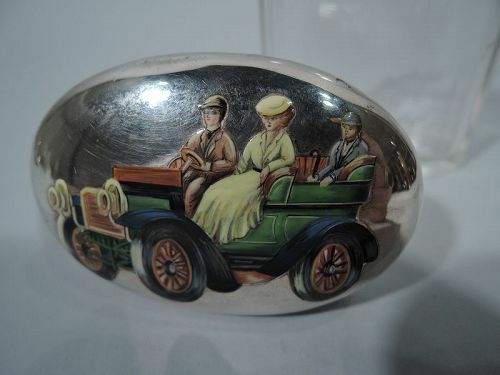 Cover has motoring scene: A Victorian lady and two gentlemen tootle along in a turn-of-the-century automobile. A sweet look back. Hallmark includes George V’s silver jubilee mark. Indistinct maker’s mark – possibly Thomas Dalton Pannett & Son, Ltd. Fine condition with strong color.